Santiago Ramón y Cajal, considered the father of modern neuroscience, was also an exceptional artist. He drew the brain in a way that provided a clarity exceeding that achieved by photographs. This traveling exhibition of Cajal’s original drawings was organized by the Weisman Art Museum in collaboration with Drs. Eric Newman, Alfonso Araque, and Janet Dubinsky, neuroscientists at the University of Minnesota and leaders in the field of neuroscience. Visit the museum site for more information. In support of The Beautiful Brain exhibit, Jamee Yung of WAM has developed a teacher resource kit titled "Drawing As A Way Of Thinking: Classroom Activities." The kit includes background information about Cajal, the neuroscientist and the artist, as well as four classroom activities spanning language arts, visual arts, science, and math. These activities are designed for middle school students and can be adapted for students in elementary and high school. Download the kit. Dr. Margaret Livingstone from Harvard Medical School is giving a free public lecture sponsored by University of Minnesota Department of Neuroscience, the Department of Art, and the Weisman Art Museum. 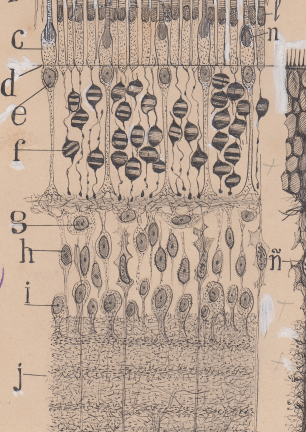 The lecture is presented in conjunction with the exhibition, The Beautiful Brain: The Drawings of Santiago Ramón y Cajal, on view at the Weisman Art Museum. More information. The Friday before the exhibit opens, the Weisman Art Museum will host a symposium about Cajal and his work. Guest speakers include Lyndel King, director of WAM; Larry Swanson, USC professor, who'll talk about "The Life and Times of Cajal;" Fernando de Castro of the Cajal Institute in Madrid on "Cajal and his Disciples: The Discoveries of the Spanish Neurohistological School;" and Eric Himmel, editor-in-chief at Abrams Books on "Drawing the Beautiful Brain." The symposium takes place Friday, January 27, 2017 from 12:00-2:30pm at the Weisman Art Museum. Download the flyer. "More than a century ago, a series of drawings transformed how scientists understood the brain." Thus goes the introduction to a story by Jon Hamilton of NPR's All Things Considered in which he interviews Dr. Lyndel King, director of the Weisman Art Museum. Listen to the January 26, 2017 All Things Considered segment about The Beautiful Brain exhibit, opening January 28. © Regents of University of Minnesota - The BrainU™ project was supported by a Science Education Partnership Award (SEPA) from the National Center For Research Resources and the Division of Program Coordination, Planning, and Strategic Initiatives of the National Institutes of Health, with additional funding from SEDAPA and ARRA. Its content is solely the responsibility of the authors and does not necessarily represent the official views of NCRR or NIH.